Which delivery options do we offer? We ship with DHL. All orders of € 40,00 or more order value qualify for free delivery within Germany. For orders with less order value we charge a € 2,90 delivery fee. Please note our international delivery rates. 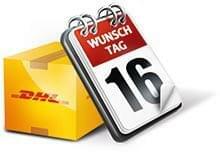 In order to make the receipt of your order as easy and convenient as possible, we offer you the services of DHL Wunschpaket for shipping within Germany. For example, if you travel a lot, you can address your parcels directly to a Packstation or branch. Or you can set a day or time to deliver your order so you can plan flexibly. Even if you order your delivery to your home, something can always come in between. Tell us a preferred neighbour or a preferred location - so the DHL delivery person can deposit your packages there, if you are not at home. With DHL Packstation you receive parcels when and where it suits you best. This will save you from having to wait for the delivery person and observe the opening hours. To use this service, you must be registered with DHL. Register now for free at the DHL website. When ordering, select the delivery to a Packstation. Enter the Packstation number directly or use the location finder to find a Packstation near you. Enter your DHL customer number (PostNummer). When your shipment has been delivered, you will receive a notification from DHL. Now you can pick up your shipment when it suits you. Quite simply with your DHL customer card (Goldcard) and your mTAN, which you have received from DHL on your mobile phone. 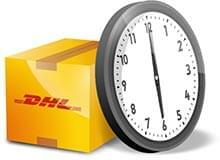 Take the opportunity to order your shipments directly to a post office or DHL parcel shop of your choice. To use this service, you must be registered with DHL. Register now for free at the DHL website. When ordering, select the delivery to a branch. Use the location finder to find a nearby post office or DHL parcel shop. Now you can pick up your shipment in the desired branch. Define a location on your property where your parcels may be deposited in your absence. Your preferred location can be, for example, a place in your garage or on your terrace. It is important that the desired location is freely accessible to the deliverer, but is protected from sight and weather. So your shipments can also be delivered when you're away from home. You can easily specify the preferred location when ordering. The DHL deliverer will only deposit the parcel if you're not at home. You will be informed by DHL and your parcel will be waiting for you when you return. Let us know about a preferred neighbour in your immediate vicinity who is willing to receive the shipments for you when you're not home. 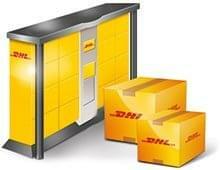 You will be informed about the delivery to your neighbour by DHL and can pick up the parcel there. The DHL delivery agent will deliver the package only if he does not meet you at home. If you know you're only available to receive parcels on certain days, or know already that you won't be home on a specific delivery day, then take advantage of the chance to specify when you'd like to receive your shipment. You will be shown several possible days for the delivery of your goods. Just pick the day that suits you best. For the delivery on the preferred day, costs of € 1,20 will be charged. When ordering, simply select your preferred time for evening delivery and provide your mobile phone number. You have the choice between a delivery between 18:00 and 20:00 or 19:00 and 21:00. In addition, you can also select the desired time of the day in many regions, in four time windows from 10:00 to 18:00. You will then receive an advance notice from DHL with the actual delivery time (accurate to 30 minutes) by SMS. The DHL driver could not find you? On the following day (Monday to Saturday) he will deliver the package to you again in the selected time slot. If you are not at home at this time, the parcel will be taken to the nearest store where you can pick it up in the next 7 business days. For the service preferred time we charge € 4,80. If you would like to return your ordered goods to us, you can create and print out the returns label yourself via our Returns Centre. Simply affix the label to the package and return it to a post office, a DHL parcel shop, a Packstation or to your DHL delivery driver. Or you arrange the pick up of your return with our customer service. The DHL deliverer picks up the package on the agreed day and sends it back to us. For express shipping within Germany with delivery from Monday to Friday we charge € 9,95 shipping costs irrespective of the payment method and order value. For express shipping with Saturday delivery we charge € 21,95 shipping. If you can't find an answer here, don't hesitate to write us an email, use our contact form or call our hotline (Mo-Fr 8:30 - 16:30 CET). We are pleased to help you!